If you don't have a router and want to create a Wi-Fi hotspot/virtual router, it can be easily done with any machine running Windows. A Computer can be used as a Wi-Fi hotspot if connected to the Internet through a Lan cable, but it must have a compatible network card. This method of creating Wi-Fi hotspot on Windows computer is useful while working with a machine connected with to the Internet with a cable modem or dial-up mode. There are two methods of creating Wi-Fi hotspot on your Windows machine, or you can say creating a virtual router, you can either use run a few commands through CMD or use third party tools. We will see them one by one. 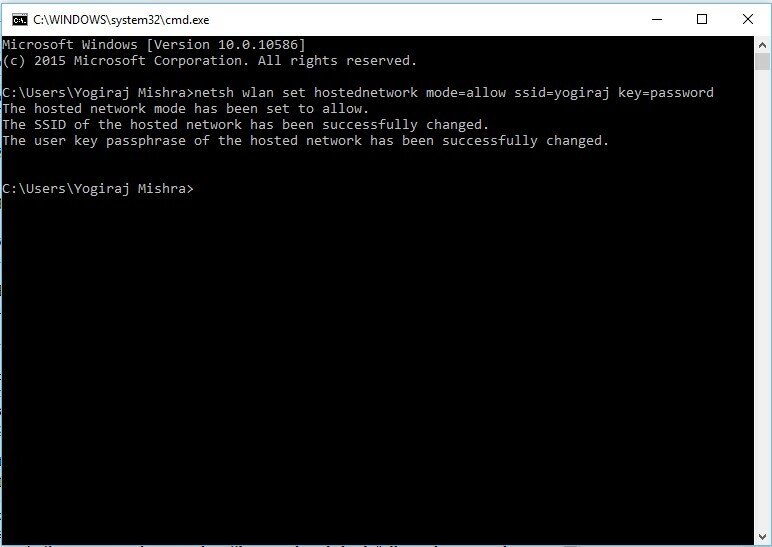 Now look for "Hosted Network Supported: yes", once found you can follow further steps for creating Wi-FI hotspot through command prompt. Create Wi-Fi hotspot network id and assign it password by running following command. Replace username with the name you want to assign to your Wi-Fi hotspot and 8digitkey with the password you want to set for your Wi-Fi hotspot. Replace 'start' with 'stop' to disable Wi-Fi hotspot. Once the Wi-Fi network is started, you can see the Wireless access point on other devices, but work is not finished yet. 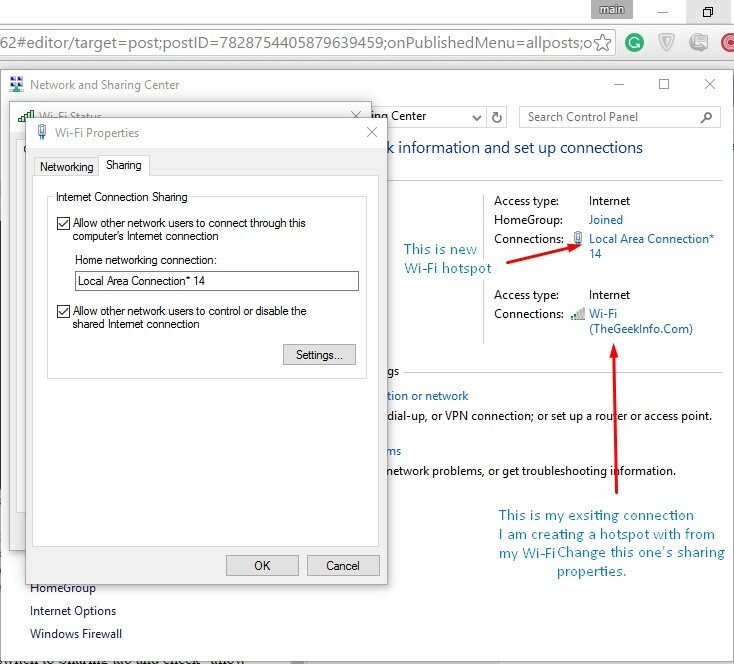 If you have multiple network connection profile on your computer, then you will need to share your current cable network to allow internet access to newly created Wi-Fi hotspot. You can enable sharing from Network and Sharing Center, click on your old existing network connection and spacious properties. In Properties window switch to Sharing tab and check "allow other networks to connected through this computer's local network option" and save the settings. To disable, create another shortcut and replace 'start' with 'stop' in above code and call it with a different name. This will make it very easy for turning your Wi-Fi hotspot on and off with just a click. In case if you are having an issue in creating your Wi-Fi hotspot do let me know in comments or try any of given tools below. Windows has started adopting Apps on their desktop and laptop version of Operating system, but software can not be replaced with apps. There is some software to create Wi-Fi hotspot but no app in available in Windows store for that because not many love using apps for everything in their Laptops, Desktops. Wi-Fi HotSpot :- Wi-Fi hotspot is a lightweight and easy to use application, it's a graphic interface for above method. You can create Wi-Fi hotspot just by entering your desired hotspot name, password and click on start. You can also see a list of connected devices at right column titled as peers. Only refresh the peers to see connected devices and you can start previously created Wi-Fi hotspot when restarting the application. Download it from here. Virtual Router :- Virtual Route is an open source software listed on Codeplex and does what it says. Just download and install and fill hotspot name and password and choose a connection to share and start the hotspot. Download it from here.